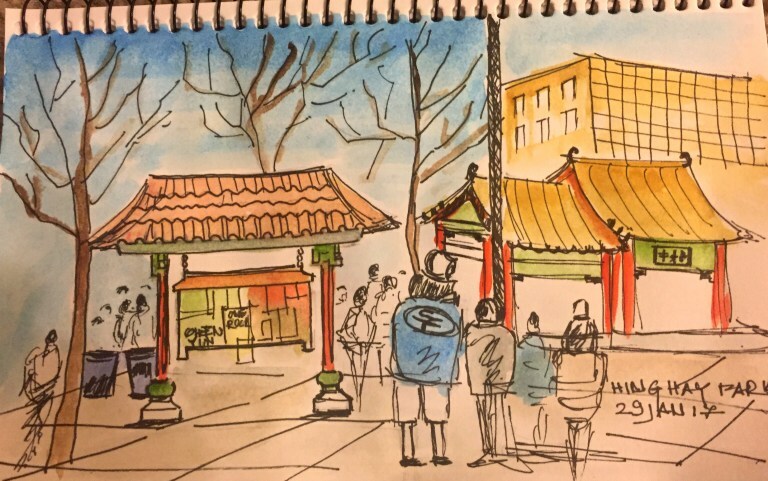 29th January 2017, Hing Hay Park was my first sketch crawl with Urban Sketchers Seattle and today at Third Place Commons monthly outing I successfully completed a year with the entire group. A memorable journey!! I was a complete new comer to the group. No known faces except seen Gabi's work. The group welcomed me and I soon became part of this wonderful family. The entire year I explored new places in Seattle with USK. 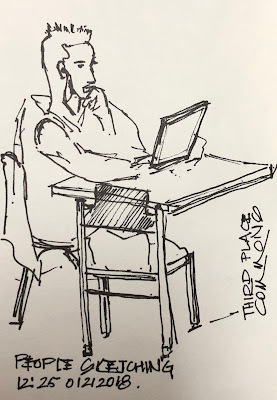 Tina's mantra "Urban sketching is not a hobby, its a lifestyle", soon imbibed into my daily routine. The constant inspiration and encouragement from fellow sketchers is a boost. Each person has different style and nothing good or bad, its simply the spirit to enjoy every bit of Sketching. I am fortunate to be an Urban Sketcher because of which I could revive my sketching passion. Today's outing at Third Place Commons had sketchers all around. 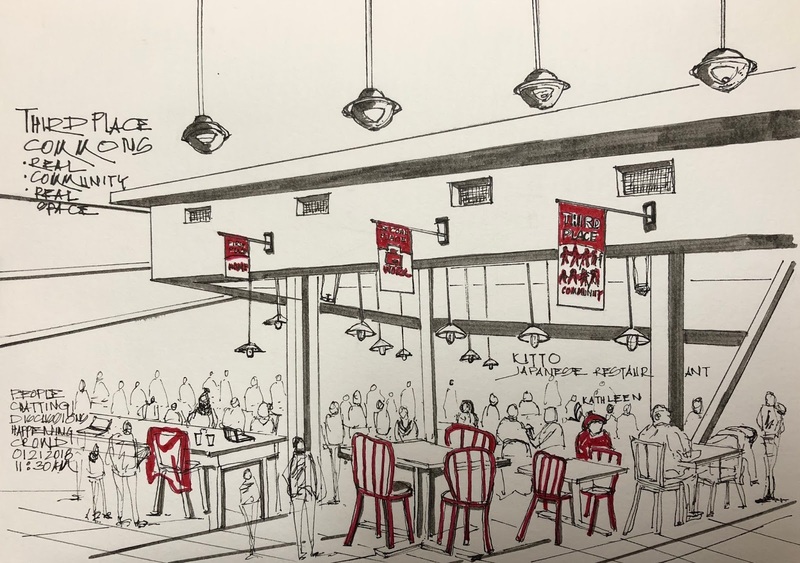 My first sketch was of the interior view capturing the sitting crowd around tables. The bright red color of chairs, flags and Kitto restaurant logo stood out boldly. As Kathleen Keckler too was wearing her reds, I outlined her. 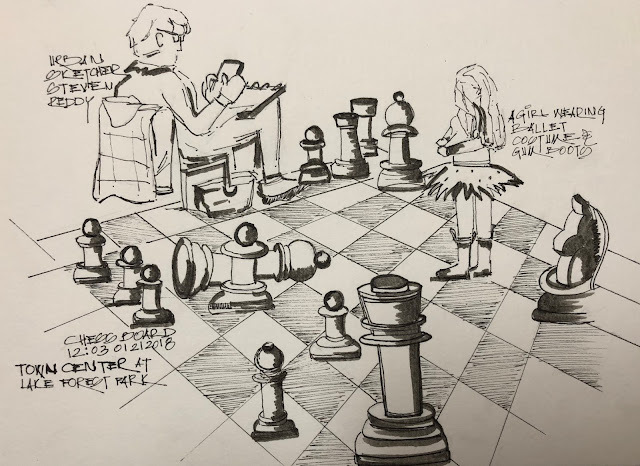 My second sketch was of the giant chess board along with a girl playing the pieces. I was able to capture Steven Reddy into my sketch. Third Place Commons is a place where all kind of people one can see, right from toddlers to old people. Indeed a happening place! 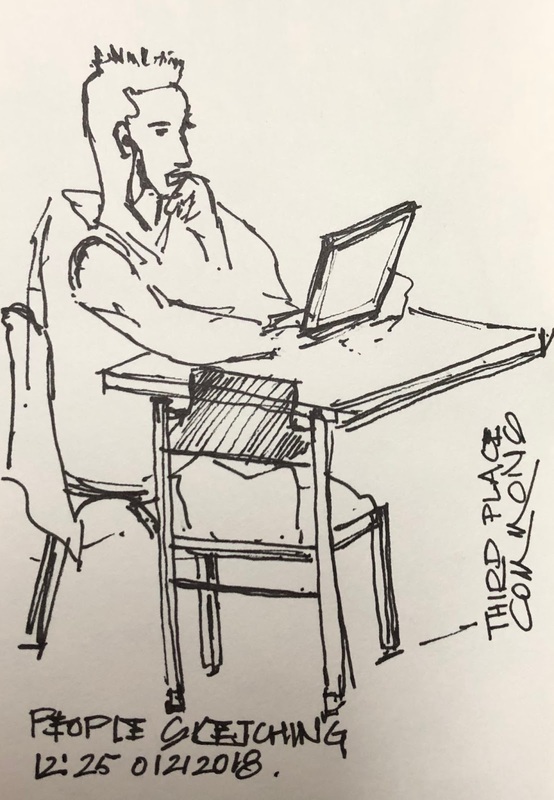 I winded up with a young man's sketch who was continuously looking at his laptop. Its a pleasure to meet fellow sketchers, exchange knowledge and mark it as an unforgettable experience. Last but not least Thank You! Gabi for this astounding creation and my fellow sketchers for immense support and motivation always. Happy Sketching! Wel-come all new comers!! Wonderful sketches! That crowd view is particularly impressive. So glad you have become one of us. Thanks Kate! It’s a pleasure. You've brought fabulous sketches as well as a delightful positive energy to the group, Ujjwal! Congrats on your first year, and here's to many, many more! Thank you so much Tina! The positivity is contagious, which our group imparts. "Once the travel bug bites there is known antidote, and I know that I shall be happily infected until the end of my life. "~ Michael Palin. Indeed Long way to go...!! Hey. I remember now! I was mistaking hing hay park with Chinese garden! Happy anniversary with uskseattle!